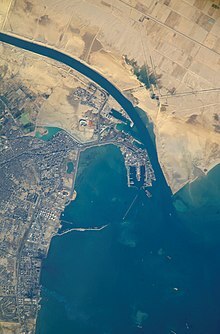 The Suez Port is an Egyptian port located at the southern boundary of the Suez Canal. It is bordered by the imaginary line extending from Ras-El-Adabieh to Moussa sources including the North Coast until the entrance of Suez Canal. Originally Port Tewfik (or Port Taufiq) was named as the entrance of the canal. Port Suez covers a larger area with multiple harbours. Enclosed in breakwaters is the artificial El Mira-El Gedda bay. Port Tewfik: to the West of the Suez Canal entrance. It uses the enclosed Ibrahim Dock. Petroleum Dock located on the east side of Suez port. Ataka Port fishing port; borders are limited by the port breakwaters. The waters outside the boundaries of Ibrahim Dock, Petroleum Dock, Ataka Port, Adabiya Port and New Petroleum berth are within the Suez Canal jurisdiction. ^ "Petroleum Port". Maritime Transport Services. Retrieved 17 September 2018. ^ "Attaka Fishing Port". Maritime Transport Services - Gov't of Egypt. Retrieved 17 September 2018. This page was last edited on 29 January 2019, at 21:39 (UTC).